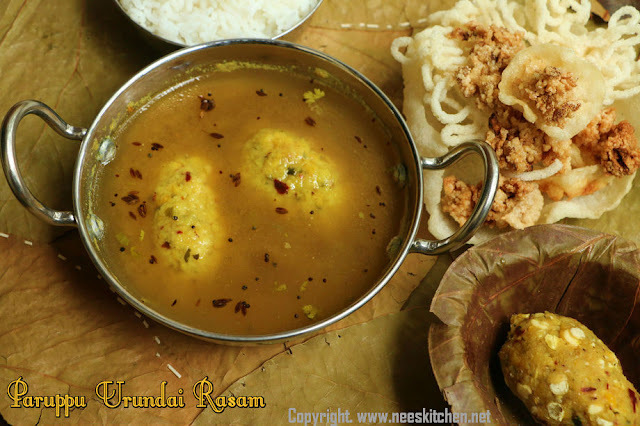 Paruppu Urundai Rasam (Lenthil Dumpling Soup) is a dish from South India. It is loaded with protein with a mix of toor & channa (chick pea) dhal. The dumpling preparation is similar to paruppu usli and you can use this to make paruppu usli if you had made this in excess. The dumplings are pressure cooked (can be steamed also) and soaked in boiling rasam. The rasam gets soaked nicely in the dumplings after 30 -40 mins with the tightness and shape of the dumplings intact. You may refer to my other method of preparing paruppu usli in this link. 1. Wash and soak Toor & Channa dhal for 30 mins. 2. Strain them and keep them aside. 3. Take a mixer and add dry chili,curry leaves, salt,hing and give a grind. 4. Add the dhal to the mixer and then grind them coarse by adding very little water. 5. Add turmeric powder and oil and grind them so that it gets mixed well. 6. Make them as loosely packed balls either round of oval shape. 8. Remove the pressure and leave them aside. 9. Juice the tamarind with water. 10. Take a pot add tamarind water, sambar powder, rasam powder, salt and let it boil until the raw tamarind smell disappears for 15 mins. 11. When its boiling add the dumplings one by one and let it cook for 10 -15 mins. 12. Switch of the gas and garnish with coriander leaves. 13. Temper the items given in “To temper” table in the order given and add it to the rasam. Paruppu urundai rasam is ready to be served with hot steaming rice and some nice vadaams. Grind the lenthil’s a bit coarse rather than a paste. The quantity of Channa Dhal and Toor dhal must be equal. Cooking time varies based on the quantity. Take curry leaves more than regular garnishing.